Aaaaaaand they’re off! March Madness is flying off to a rip-roaring good start, to the delight of beauty fans of all ages. 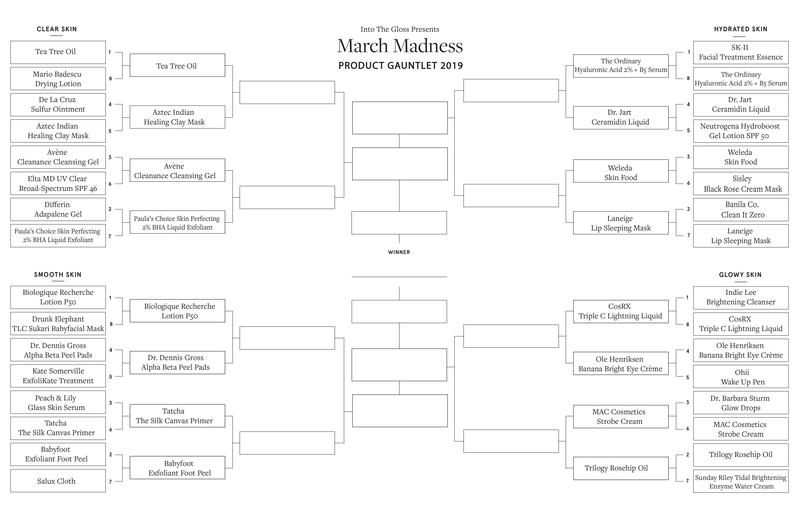 Round 1 went just as our team of highly trained experts predicted, with a few upsets to take note of as you prepare to vote in the next round. - You don’t need to be a brand to win big. Tea tree oil, literally any tea tree oil, won the first match-up against cult classic Mario Badescu Drying Lotion. See ya later, pink stuff. See you on the other side. - It was a bad round for sunscreen! Both Elta MD and Neutrogena Hydroboost SPFs were knocked out in the first round—Elta to Avène’s Cleanance Cleanser, Neutrogena to Dr. Jart’s Ceramidin Liquid. Don’t @ us, this was a group decision. Your hands aren’t clean either. - No matter how many times Emily Ferber name checks the best spot treatment in the world, De La Cruz Sulfur Ointment (in the 2018 Top 25! In her story yesterday! ), it will never be enough to give it the strength to beat the Aztec Indian Clay Mask (which won 84% of the vote, mind you). She is inconsolable and will be unavailable for comment until further notice. So what do we do now? Well, vote again! It’s only going to get tougher—you might want to take the weekend to think about it. See you on the other side.